Ireland was a laboratory for every manner of colonial repression by the British; 100 years after the Easter Rising, it is once again—this time by banks. He was reading from a proclamation, the ink barely dry, of a provisional Irish government declaring its independence from British rule. It was just after noon on April 24, 1916, the opening scene in a drama that would mix tragedy and triumph, the twin heralds of Irish history. 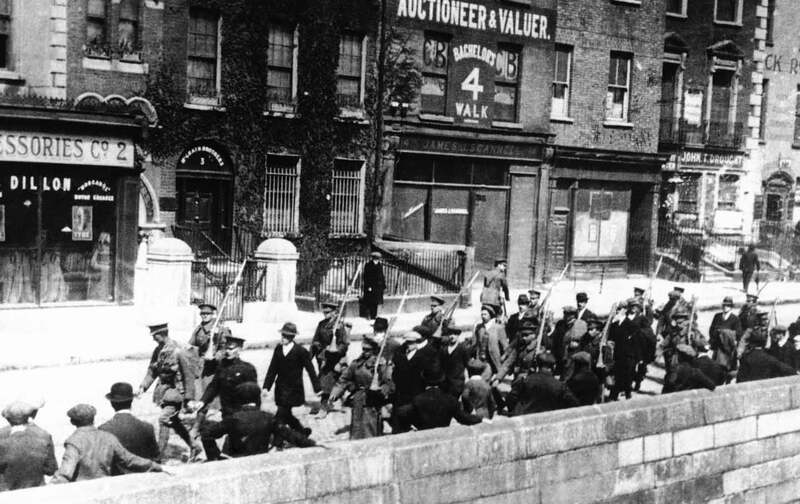 It’s 100 years since some 750 men and women threw up barricades and seized key locations in downtown Dublin. They would be joined by maybe 1,000 more. In six days it would be over, the post office in flames, the streets blackened by shell fire, and the rebellion’s leaders on their way to face firing squads against the walls of Kilmainham Jail. And yet the failure of the Easter Rebellion would eventually become one of the most important events in Irish history—a “failure” that would reverberate worldwide and be mirrored by colonial uprisings almost half a century later. Anniversaries—particularly centennials—are equal parts myth and memory, and drawing lessons from them is always a tricky business. Yet while 1916 is not 2016, there are parallels, pieces of the story that overlap and dovetail in the Europe of then with the Europe of today. Europe in 1916 was a world at war. The lamps, as the expression goes, had gone out in August 1914, and the continent was wrapped in barbed wire and steeped in almost inconceivable death and destruction. Shortly after the last Irish rebel was shot, the British launched the Battle of the Somme. More than 20,000 would die in its first hour. By the end, there would be more than a million casualties on both sides. Europe is still at war, in some ways retracing the footsteps of a colonial world supposedly long gone. Britain is fighting its fourth war in Afghanistan. Italian special forces are stalking Islamists in their former colony Libya. French warplanes are bombing their old stomping grounds in Syria and chasing down Tuaregs in Mali. And Europe is also at war with itself. Barbed wire is once again being unrolled, not to make killing zones out of the no man’s land between trenches but to block the floods of refugees generated by European—and American—armies and proxies in Afghanistan, Iraq, Yemen, Somalia, and Syria. In many ways, the colonial chickens are coming home to roost. The British and French between them secretly sliced up the Middle East in 1916, using religion and ethnicity to divide and conquer the region. Instability was built in. Indeed, that was the whole idea: There would never be enough Frenchmen or Englishmen to rule the Levant, but with Shiites, Sunnis, and Christians busily trying to tear out one another’s throats, they wouldn’t notice the well-dressed bankers on the sidelines—“tut-tutting” the lack of civilized behavior and counting their money. The Irish of 1916 understood that gambit—after all, they were its first victims. Ireland was a colony long before the great powers divided up the rest of the world in the 18th and 19th centuries, and the strategies that kept the island poor, backward, and profitable were transplanted elsewhere. Religious divisions kept India largely docile. Tribal and religious divisions made it possible to rule Nigeria. Ethnic conflict short-circuited resistance in Kenya and South Africa. Division by sect worked well in Syria, Lebanon, and Iraq. Ireland was the great laboratory of colonialism where the English experimented with ways to keep a grip over the population. Culture, religion, language, and kinship were all grist for the mill. And when all else failed, Ireland was a short sail across the Irish Sea: Kill all the lab rats and start anew. The fact that the English had been in Ireland for 747 years by 1916 was relevant. The Irish call the occupation “the long sorrow,” and it had made them a bit bonkers. Picking a fight in the middle of a war with one of the most powerful empires in human history doesn’t seem like a terribly rational thing to do—and in truth, there were many Irish who agreed it was a doomed endeavor. What both Connolly and Lenin understood was that the uprising reflected a society profoundly distorted by colonialism. Unlike many other parts of Europe, in Ireland different classes and viewpoints could find common ground precisely because they had one similar experience: No matter what their education, no matter what their resources, in the end they were Irish, and treated in every way as inferior by their overlords. Most of the European left was suspicious of nationalism in general because it blurred the lines between oppressed and oppressors and undermined their analysis that class was the great fault line. But as the world would discover half a century later, nationalism could also be an ideology that united the many against the few. In the end, it would create its own problems and raise up its own monsters. But for the vast majority of the colonial world, nationalism was an essential ingredient of national liberation. The Easter Rebellion wasn’t the first anticolonial uprising. The Americans threw off the English in 1783; the Greeks drove out the Turks in 1832. India’s great Sepoy rebellion almost succeeded in driving the British out of the subcontinent in 1857. There were others as well. But there was a special drama to the idea of a revolution in the heart of an empire, and it was that drama more than the act itself that drew the world’s attention. The Times of London blamed the Easter Rising for the 1919 unrest in India, where the British army massacred 380 Sikh civilians at Amritsar. How the Irish were responsible for this, the Times never bothered to explain. As an uprising it was a failure, in part because the entire affair was carried out in secret. Probably no more than a dozen or so people knew that it was going to happen. When the Irish Volunteer Force and the Irish Citizens Army marched up to the post office, most of the passersby—including the English ones—thought it was just the “boys” out having a little fun by provoking the authorities again. But secrets don’t make for successful revolutions. The plotters imagined that their example would fire the whole of Ireland, but by the time most of the Irish had found out about it, it was over. Compared with other uprisings, it wasn’t even an overly bloody affair. There were about 3,000 casualties and 485 deaths, many of them civilians. Of the combatants, the British lost 151 and the rebels 83—including the 16 executed in the coming weeks. It devastated a square mile of downtown Dublin, and when British troops marched the rebels through the streets after their surrender, crowds spit on the rebels. But as the firing squads did their work day after day, the sentiment began to shift. Connolly was so badly wounded he could not stand, so they tied him to a chair and shot him. The authorities also refused to release the executed leaders to their families, burying them in quicklime instead. Some 3,439 men and 79 women were arrested and imprisoned. Almost 2,000 were sent to internment camps, and 98 were given death sentences. Another 100 received long prison sentences. None of this went done well with the public, and the authorities were forced to call off more executions. And the idea of an “Irish republic” wasn’t going to go away, no matter how many people were shot, hanged, or imprisoned. Many of those divisions remain. There will be at least two celebrations of the Easter Rising. The establishment parties—Fine Gael, Fianna Fail, and the Labor Party—have organized events leading up to the main commemoration March 27. Sinn Fein, representing the bulk of the Irish left, will have its own celebration. Several small splinter groups will present their own particular story of the Easter rising. And if you want to be part of it, you can go on the Internet and buy a “genuine” Easter Rebellion T-shirt from “Eire Apparent.” Everything is for sale, even revolution. In the short run, the Easter Rebellion led to the executions of people who might have prevented the 1922–23 civil war between republicans and nationalists that followed the establishment of the Irish Free State in 1921. The Free State was independent and self-governing, but still part of the empire, while the British had lopped off Northern Ireland to keep as their own. Ireland didn’t become truly independent until 1937. Does the centennial mean anything for today’s Europe? It may. Like the Europe of 1916, the Europe of 2016 is dominated by a few at the expense of the many. The colonialism of empires has been replaced by the colonialism of banks and finance. The British occupation impoverished the Irish, but they weren’t so very different from today’s Greeks, Spanish, and Portuguese—and yes, Irish—who’ve seen their living standards degraded and their young exported, all to “repay” banks from which they never borrowed anything. Do most Europeans really control their lives today any more than the Irish did in 1916? How different is today’s “troika”—the European Central Bank, the European Commission, and the International Monetary Fund—from Whitehall in 1916? The latter came uninvited into Ireland; the former dominates the economic and political life of the European Union. In his poem, “Easter Week 1916,” William Butler Yeats called the rising the birth of “a terrible beauty.” And so it was. Editor’s note: This article has been corrected from the original, which mistakenly said that the Easter Rising began on March 24, 1916, rather than April 24.